Discussion in 'Soundgear' started by Djoezie, Feb 11, 2019. I want to buy a new audio interface so i saved up some money and did some research and the zen tour and fireface UCX are the ones im doubting about. Im a hiphop producer/beatmaker and i record vocals and some instruments from time to time. I hope u guys can give me some pro's and cons or maybe change my mind and suggest me something different. Very curious on the outcome of this . Owner of a UCX it's an awesome soundcard,it works perfectly,probably my best buy ever.Low latency,best drivers and stability,the TotalMix Fx is well designed(routing options are the best),clean(too for some people) preamps,clean and powerfull sound. But the UCX has few inputs ( 8 analog ) and outputs ( 6 analog ).If you're thinking to buy some external hardware in the future(synths,reverb,compressor,etc),you'll rapidly use all of them.Only you knows if it will be enough or not. Its headphones preamp isn't very powerfull too.I've 250 Ohms headphones;I hear clearly,no problem,but it isn't very powerfull. If I had to buy one soundcard again,maybe I would think about the RME fireface UC (usb) too ,pretty same hardware with the UCX except it doesn't have the Firewire port and it doesn't have any FXs and of course the Totalmix FX,but it costs 200$ or 300$ less than the UCX. After 6 years I've never used its FXs.But the UC can't handle the RME remote control too I think,which is very usefull ! If if you have the money and you find 8 analog inputs enough,go with the UCX,buy it on trust.You won't regret it. Maybe have a look at the Universal Audio Apollo Twin MkII Quad if you don't need many inputs and outputs.UA interfaces have great customers feedback too.But I don't know them. I'm a big fangirl of RME for all of the reasons stated above. I bet if you polled 100 pro studio owners, engineers and producers it would be approximately 100-0 in favour of the UFX as there really is nothing to fault with the RME except the weakish (anything under 250 ohm is covered no problem) headphone amp. I personally have never seen the Zen Tour as the brains of a working facility, the Antelope Orion for sure, but never ever a Zen Tour. Catchy name though! I'm a big fangirl of RME for all of the reasons stated above. I bet if you polled 100 pro studio owners, engineers and producers it would be approximately 100-0 in favour of the UFX as there really is nothing to fault with the RME except the weakish (anything under 250 ohm is covered no problem) headphone amp. The Antelope Zen Tour is very nice...It's more modern than the UCX which is from 2012,for sure.The Zen Tour has nice and FREE built-in FXs,from Overloud,many preamps/inputs Outputs,many features.I don't know about its reliability,and what think customers,but it seems to be a good choice too. Ok, you're right. I'll ammend to any and all iterations of UFX. I have the original Crimson and I like it. SPL is known for their analogue equipment, and this interface is analogue at heart (no software required to operate it). I bought it on features, as I wanted something that is great for casual listening, and I also needed coax SPDIF. 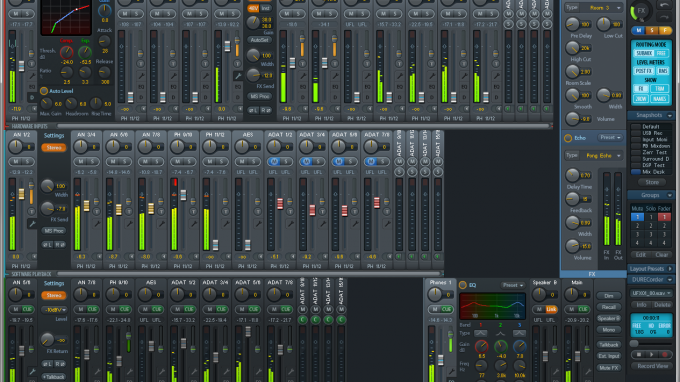 It does the job for me in the studio as I have specific requirements, and I know how to get the best out of this unit. The 2 preamps are good, it has Hi-Z, 4 line-in, 2 digital in and out, and you can run two sets of monitors (or use it as a send for reamping, etc). Given the choice between Antelope and RME, I would choose the RME for their drivers and support. All of their legacy equipment still works with Win 10 and the latest Mac OS. Antelope on the other hand are starting to drop models, and you may also like to investigate their old connections with Aardvark. The Zen Tour looks like a great interface, but on balance I would go with the RME, possibly waiting for an updated model. Do your own careful research, there are a lot of user reviews online, and pay attention to the customer service, how each company handles any hardware/software problems, etc. P.S. also take a look at the RME Babyface Pro if you don't need too many ins and outs. Hello Zenarcist, what do you like about the newest iteration of Crimson, and does it need a driver for Windows? I am contemplating a no frills, easy portable card that has no fuss or muss. How would you describe the preamps compared to the ultra-ish clean Babyface Pro's?